A very important point in the preparation for the holiday is a beautiful presentation of dishes for the feast. To create bright accents and give the table a festive look with beautiful and unusual decorated with cuts of vegetables. Standard is the presence of a vegetable platter of cucumbers, peppers and tomatoes, but the tomatoes need to choose tight to their flesh does not leak to the dish. These vegetables go very well with kebabs of various meats, chicken. But should not be limited to these vegetables. Radishes, carrots will become bright accents cut vegetables, and in combination with herbs, olives and onion rings may even become a full-fledged starter for a festive table. In addition to fresh vegetables, for slicing you can use salted and pickled products. Corn, tomatoes, cucumbers, pickled onions or cabbage can be formed of a multicomponent snack that is perfect as a complement to meat dishes, will be relevant at the table, where there are spirits. The simplest one is cutting all the vegetables slices, it is possible to put it on a plate in the form of pile to form the likeness of a snail. This method of design saves space on your dish, allowing you to place on one plate maximum number of products. If used in cutting carrot, sweet pepper, asparagus, it is better to cut thick strips. At the same time on the plate you can alternate between the display of straws and slices of vegetables (for this purpose it is more convenient to use radishes, cucumbers, tomatoes). To vegetables did not look banal and boring on the plate, from the radish, you can clip the likeness of the colors, cucumbers cut into long plates that can be spun randomly, securing all the beauty of toothpicks. As a decoration to vegetable cutting suitable lettuce leaves, leaves of parsley, which can be placed between the main products. If there is no time to the emergence of creativity and beauty to the table you want to create, you can apply for serving the dish with slices. Near meats you can put containers with olive oil, sauce, pepper and various spices. 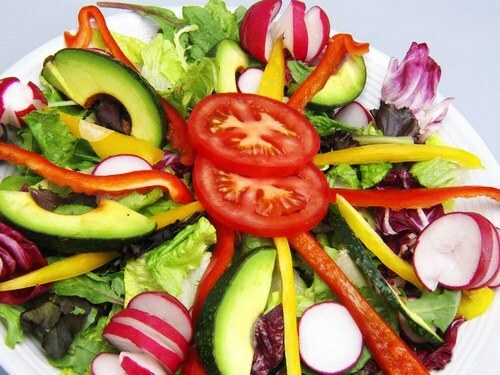 On the mid-plane of the plate to put the bowl with the sauce around which is better in the form of a circle to place bright vegetables, sliced, slices, strips. Particularly interesting will look vegetables, are laid out in the shape of a flower, snake, or bright pattern. This cutting will give the table a festive and unusual appearance, improve the mood of the guests with their bright colors.